The hamper.com Affiliate Program is a great way for bloggers, reviewers and website owners to make money by promoting our range of hampers and gifts. It's completely free to become a hamper.com affiliate and the earning potential is unlimited! 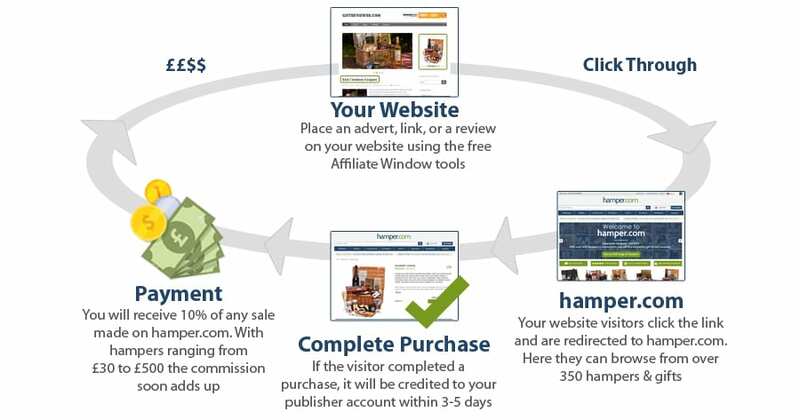 If you have a website, our affiliate program allows you (the publisher) to place links to hamper.com on your site. For every purchase made through your website we pay you 10% of the sale. What kind are publishers are we looking for? N.B. We are currently not accepting any new discount/voucher sites on our affiliate platform. Why promote Hamper.com on your site? Dramatically increased basket size at Christmas & other special occasions. Regular offers around annual occasions such as Easter, Mother’s Day, Father's Day & Valentines. We have various seasonal and regular banners of all sizes to promote our brand on your site. if you need something specific please contact us and we’ll be happy to help. Every September we update our range for the year, including price, content and image adjustments. We also provide a quarterly newsletter containing the latest from hamper.com, promotional codes and events. Our affiliate programme is run via Affiliate Window. You can join Affiliate Window and start earning with Hamper.com. Simply set up an Affiliate Window Publisher account to get started.